Call The Aerial Guys today on 01706 538045 for a no obligation estimate and to arrange an appointment. If you live in Rawtenstall and are looking for local TV or satellite installation and repair experts, then call The Aerial Guys. We are passionate about providing you with the best possible service. Contact us today on 01706 538045 to book an appointment. Our extensive network of engineers cover the entire North of England, which means we can nearly always promise that an engineer is available to come to your Rawtenstall home to assess your television aerial, usually on the same day. After tending to countless TV aerial installations in Rawtenstall over the years, we really do believe we know our business better than anyone. And, unlike the bigger companies, The Aerial Guys guarantee to deliver a reliable, local service that you can depend on. Call us today on 01706 538045. At The Aerial Guys, our professional and friendly engineers will assess your TV aerial requirements on arrival, agreeing the fixed fee, upfront quote before any work can start. From TV aerial repairs in Rawtenstall, to installing a new TV setup, The Aerial Guys are always nearby, ensuring you get the best picture quality possible. So, why not speak to one of our technical advisers today on 01706 538045 to find out how to arrange a visit from your local engineer in Rawtenstall. The Aerial Guys are also experts in satellite installation and repairs. 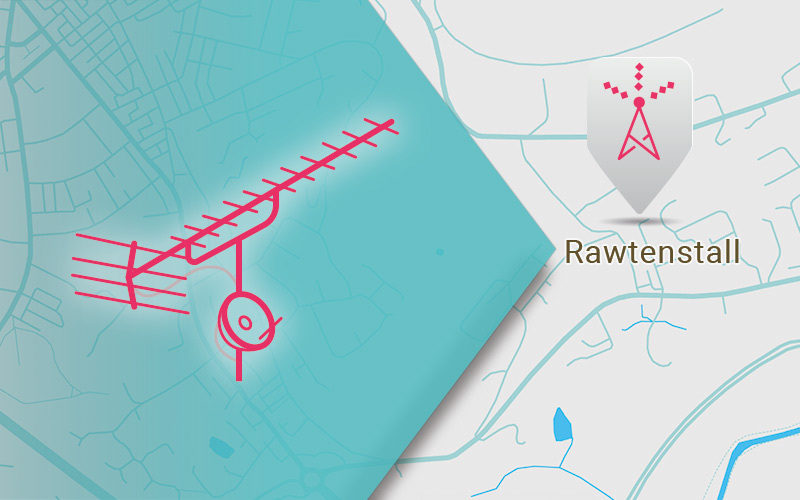 So if you’re looking for a complete satellite installation in Rawtenstall, then our engineers can sort out the whole system – from fitting your satellite dish, to configuring your set-top box and sorting the cabling. At The Aerial Guys, we have specialist knowledge in all the main satellite services, including Sky, Freesat and European satellite installations. Call us today on 01706 538045. If your satellite signal is scrambled or appears to be pixelated, then please do not worry, as The Aerial Guys are fully equipped to carry out satellite repairs in Rawtenstall and the surrounding areas. Our team of professional engineers permanently stock a wide range of equipment suitable for all the main satellite platforms, which means that we can usually fix the problem there and then. So, if you live in the Rawtenstall area, and need a local satellite repair service, make sure you speak to The Aerial Guys as soon as possible on 01706 538045. Did you know that you can watch Sky TV in different rooms with Sky Multiscreen or a tvLink? All the channels you subscribe to are available on all Sky boxes, and you can have four Sky+HD boxes or eight Sky Multiscreen boxes running from the same dish. To enjoy Sky Multiscreen, each TV in your house needs its own Sky box and they must all be connected to the same phone line, unless you activated your viewing card after 17 December 2013, in which case no phone line connection is needed. Speak to The Aerial Guys today to find out how we can help set up Sky in several rooms of your home. “I’m a single Dad, so TV can come in really handy with the kids. I try to minimise their viewing but that isn’t always possible. But when the picture quality started to go a bit shaky at home it caused all sorts of problems. I tried everything to fix it but nothing seemed to work,” Thomas says. In the end, Thomas had to take action and contacted The Aerial Guys. An engineer was with him the very same day. “I didn’t think they’d be able to help because our satellite system is quite old, but they had the part we needed in stock in their van already. The whole system was back up and running by lunchtime! When the kids got home from school, they were thrilled. I was really impressed with the swift service and the calm manner of the engineer. Meeting The Aerial Guys and seeing what they do has really changed my opinion of service engineers. They were excellent,” he says.